Fig. 9. Calculation of trans-aortic gradients by continuous-wave Doppler. In some situations, patients present with severe aortic stenosis (calculated AVA <1.0 cm2) and low trans-valvular gradients (<30 mmHg). These patients have low ejection fractions and low cardiac output (Fig. 6). In this situation, the calculated AVA may be small secondary to the low flow state, and should be interpreted with caution. These patients may benefit from further testing to differentiate true severe aortic stenosis from apparent severe aortic stenosis owing to a functionally stenotic valve because of the low output state. Dobutamine echocardiography can help to differentiate these two conditions. With the infusion of low-dose dobutamine, stroke volume increases and the calculated AVA increases in those with functionally stenotic valves. However, in those with true severe aortic stenosis, the calculated AVA remains unchanged. Low-dose dobutamine challenge therefore can assess the "contractile reserve"—a predictor of which patients are more likely to benefit from aortic valve replacement. Even patients with critical stenoses (valve area <0.75 cm2), low gradients (<30 mmHg), and low ejection fraction (<35%) may benefit from aortic valve replacement if they exhibit contractile reserve. Those who do not exhibit augmentation in cardiac output are problematic and prognosis is generally poor. The quantitative assessment of severity with low-dose dobutamine challenge should follow the same guidelines as in other situations (AVA, trans valvular gradients, and dimen-sionless index). Although planimetry may be used to measure the orifice area by transesophageal echocardiography, it is not commonly implemented in clinical scenarios, as transvalvular gradients and AVA can be easily applied in most situations. The accurate assessment of aortic stenosis severity is contingent on factors related to the subject, image acquisition and analysis, and the interpretation of the data (Table 4). Potential pitfalls related to the patient cannot be helped, but the importance of a meticulous transthoracic examination by a skilled operator cannot be overstated. It is essential to acquire the maximum velocity using multiple windows to avoid underestimation of the peak velocity measurement and hence over-estimation of AVA (Fig. 8). In addition, because the LVOT radius is squared in the continuity equation, careful measurement of this parameter is crucial for accurate calculations. Fig. 10. Distinguishing aortic stenosis from mitral regurgitation on Doppler examination. Both jets both occur in systole and appear as downward spectral velocity shifts when recorded from the apex. The onset of ventricular systole and mitral regurgitation occurs prior to aortic valve opening. In addition, mitral regurgitation is longer in duration. accurate peak transaortic gradient. In this situation, the proximal velocity cannot be ignored, as the modified Bernoulli is based on a negligible value for the proximal velocity. Fig. 11. 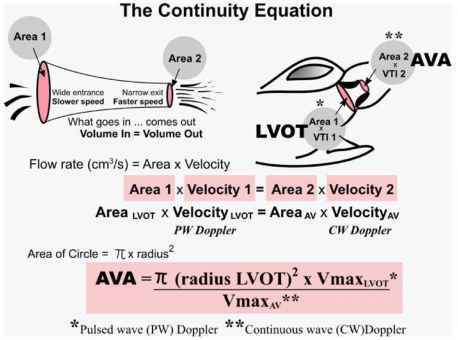 The continuity equation and assumptions for measuring aortic valve area (AVA) in aortic stenosis. regurgitation. Mitral regurgitant velocities generally exceed 4-5 m/s, and usually exceed the transaortic velocity when found in the same patient. 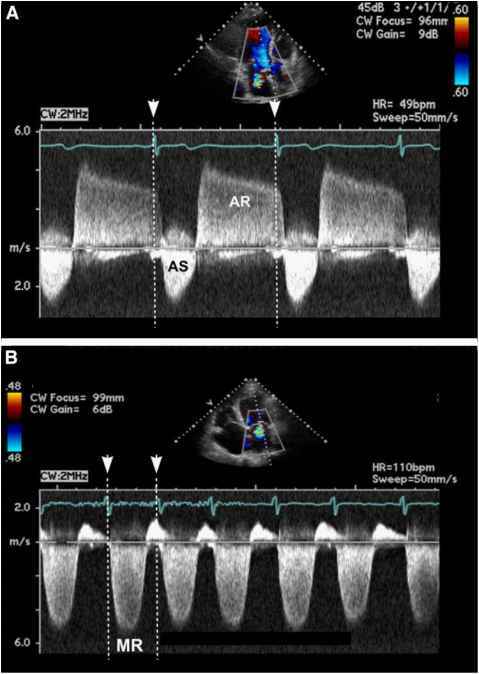 A subaortic membrane should be considered when high velocities are observed on CW Doppler in the setting of normal aortic valve leaflet excursion on 2D examination. Local flow acceleration during color flow Doppler examination can often be seen in the LVOT even when no membrane is seen on transthoracic imaging (Fig. 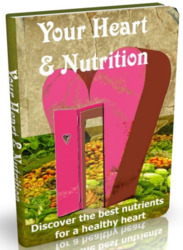 13; please see companion DVD for corresponding video). In this situation, trans-esophageal echocardiography may confirm the presence of a subaortic membrane. Early systolic closure of the aortic valve leaflets on M-mode imaging may be seen in this condition. A complete assessment of aortic stenosis incorporates other aspects of the transthoracic echocardiogram, as well as other factors that predict progression in individual patients. Aortic insufficiency frequently accompanies aortic stenosis and should be taken into account when considering surgery. The degree of left ventricular hypertrophy and LV function reflects the hemodynamic impact of the stenosis. Pulmonary hypertension in the presence of severe aortic stenosis may be an ominous sign. The presence of a bicuspid aortic valve should always prompt a search for coarctation of the aorta, because there is an established association between the two conditions. Transthoracic echocardiography is the standard for evaluation of aortic stensosis severity. If a careful examination is performed, cardiac catheterization is rarely needed for confirmation. Many institutions only employ cardiac catheterization merely to assess coronary arteries' status prior to aortic valve replacement. 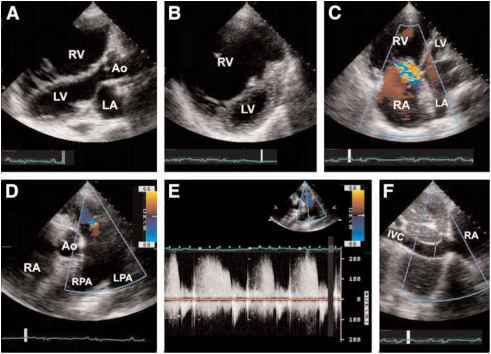 Transthoracic echocardiography remains a comprehensive tool in the initial diagnosis, follow up, and management of patients with aortic valvular disease.